The Association is the owner of the Worldwide STANDARD for Home and Building Control: KNX and also the owner of the KNX trademark logo worldwide. KNX Association is a non profit-oriented organisation governed by Belgian Law. Members are manufacturers developing devices for several applications for home and building control based on KNX like lighting control, shutter control, heating, ventilation, air conditioning, energy management, metering, monitoring, alarm/intrusion systems, household appliances, audio/video and lots more. 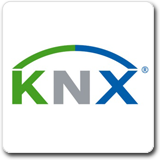 Next to manufacturers also service providers (utilities, telecom, ...) can become a member of the KNX Association. Next to its members, KNX Association has concluded partnership agreements with more than 30.000 partners in more than 75 countries worldwide.